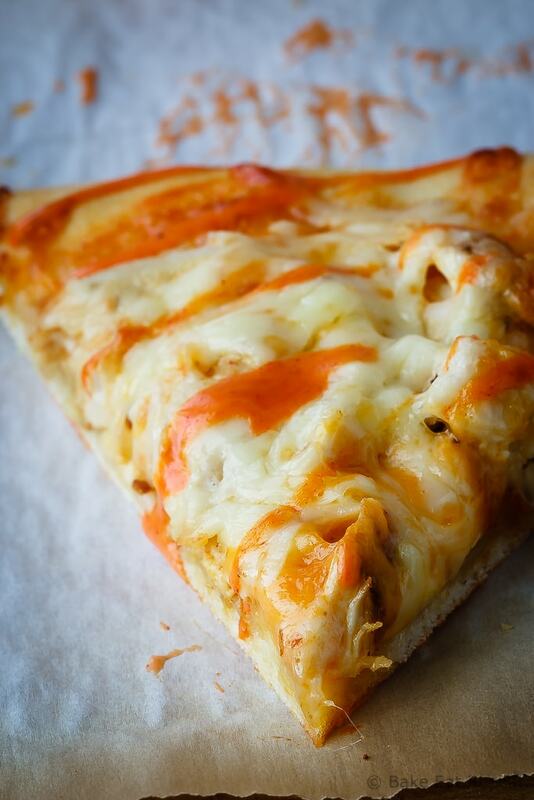 Buffalo Chicken Pizza Recipe - Bake.Eat.Repeat. 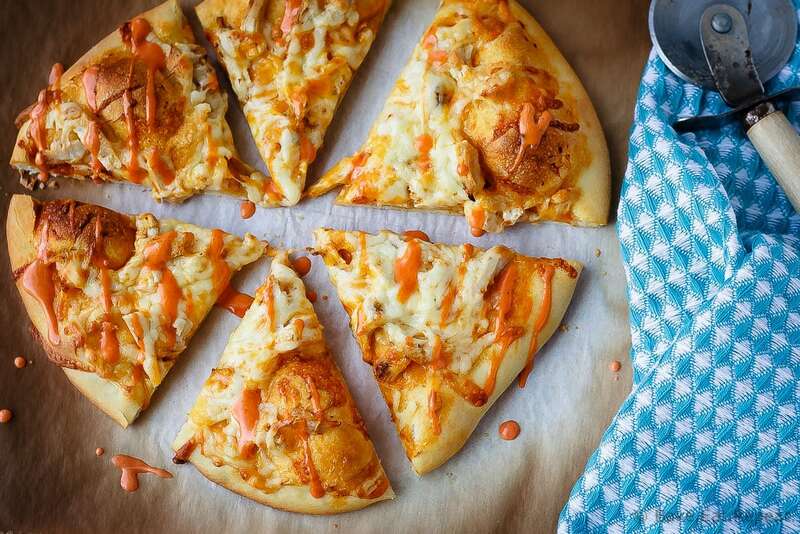 This buffalo chicken pizza is our favourite for pizza night – easy to make and so full of flavour, if you love buffalo chicken you will love this pizza! Buffalo chicken pizza is the BEST pizza in the world. Is that overselling it? Probably. But seriously, so good. We can’t get enough of this pizza. I make pizza on a fairly regular basis, but cannot seem to make any version other then this buffalo chicken one. For like a year. At least. It’s maybe becoming an issue. There was a brief period where I made this caprese pizza almost as regularly, but then I would often just have to make two smaller pizzas rather then one big one just so that we could have both kinds. Because I couldn’t make pizza without making a buffalo chicken pizza. If you like buffalo chicken at all, you will love this pizza. I can pretty much guarantee that. And it’s so simple, that’s the beauty of it. There’s never any problem with having everything I need to make it. Chicken, ranch dressing, and buffalo chicken hot sauce. That’s it. Well, and cheese. But I pretty much always have those things in the fridge so I can have buffalo chicken pizza at a moment’s notice. It’s maybe a bit dangerous. I’ve made this pizza with my favourite thin crust pizza dough, and this no-rise pizza dough, and both are fantastic. The one pictured here is the no-rise pizza dough because, well, pizza at a moment’s notice. I felt like pizza for lunch – it was ready in a half hour. Like I said – dangerous. You should definitely make it soon and join me in the buffalo chicken pizza obsession. Pizza Friday anyone? 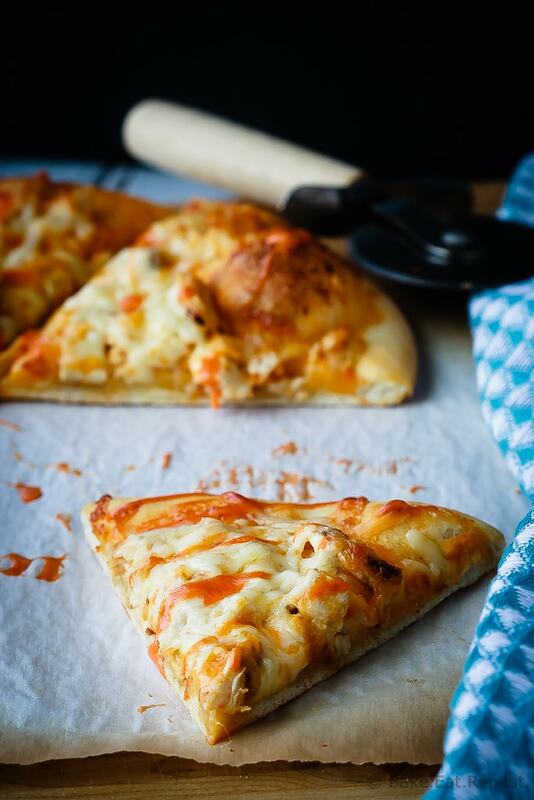 This buffalo chicken pizza is our favourite for pizza night - easy to make and so full of flavour, if you love buffalo chicken you will love this pizza! Preheat the oven to 500 degrees F. If you have a pizza stone place it in the oven to heat up. If you don’t have one, an upside down cookie sheet works well instead. Stretch your pizza dough out into two ten inch rounds. We like to assemble the pizza on a piece of parchment paper to make sliding it into the oven easier - you can slide the parchment right onto the stone and them slide it back out again when it’s baked. In a small bowl, stir together the ranch dressing and the buffalo chicken sauce. Spread half onto each pizza. Sprinkle the shredded chicken over top of the sauce and then spread the cheese evenly over the chicken. Slide the parchment paper with the prepared pizza onto the hot stone in the oven and bake for 9-10 minutes or until the crust is browned and the cheese is bubbling. Drizzle a little more buffalo sauce over top of the pizza. Allow the cheese to set for about 5 minutes before cutting and serving. Does each piece of pizza have 170 calories in it? Do you know ? I would assume the calorie count would be similar to most pizza, but it would really depend on the types of cheese, ranch and buffalo sauce you use. You can get a pretty good estimate with an online calculator (just google nutrition calculator) if you plug in the ingredients. Are we spreading the toppings on the raw dough? Yes, you spread the toppings on the raw dough before baking the pizza. Great, easy recipe! I made one as directed for my husband and me, and one without the buffalo sauce for the kids. Everyone loved it! That's what I usually do too - the kids aren't a fan of the buffalo sauce yet! Glad you loved it! Did i read that right ? 6 TB of sauce for 2 20" pizzas ?? Yikes, total typo, should say two 12 inch pizzas! Thanks for letting me know, I'll fix that! Oh my goodness, that cheese!! I'm a total buffalo chicken fan so this pizza is so up my alley! So gorgeous, Stacey! Hi Jeff - I use 3 tablespoons of each, mix them together, and then divide it between the two pizzas. That gives you 3 tablespoons of sauce (total) per 10" pizza which I find is enough. You could definitely add more if it doesn't look saucy enough for you though! This pizza looks delicious and is so crazy easy to assemble- love it!